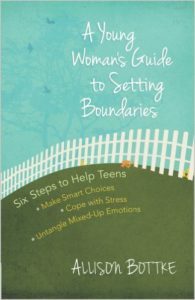 Setting healthy limits and managing conflicting emotions is a never-ending ques t for women, no matter how old we are. However, this quest can be especially challenging for teens who are still developing in many ways. You’re trying on different personas in a quest to find your identity, and combined with the hormonal changes of puberty (what a yucky word, but there’s really nothing else to explain this equally yucky time) followed by the turbulence of adolescence; it’s easy to become confused, frustrated, and simply lost. The result is that it becomes easier to make not-so-smart choices or to simply passively go where you really don’t want to go. 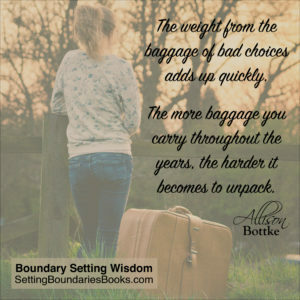 The weight from the baggage of bad choices adds up quickly. The more baggage you carry throughout the years, the harder it becomes to unpack. If you’re not careful, your mind and heart can begin to look like the inside of a house on a TV episode of “Hoarders,” cluttered, desperate, and dangerous to navigate. The only way to keep from getting buried under a mess of emotions and experiences is to learn the critical importance that boundaries have in your life, and the valuable skill of how to make smart choices based on rational thinking and not just on emotional feeling. Teens are perfectly capable of making good decisions when their minds are calm, but the part of the brain that helps you manage emotions is still developing, so you’ll naturally have a harder time calming your emotions down, and that’s when bad judgment often triumphs over good judgment. It’s good to have emotions—it’s good to be able to feel things deeply and passionately. However, the trouble comes when we lack self-control and place our feelings and emotions above our safety, or above the safety of someone else.